If you cut the Calla Lily for a vase, is that the end of it or do they continue to produce new flowers? Hopefully your plant will produce multiple blooms. 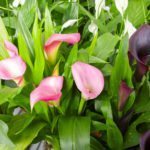 Here is a link to care of Calla Lily plants.